NASA’s worried that Greenland’s melting could accelerate. As the world prepares for the most important global climate summit yet in Paris later this month, news from Greenland could add urgency to the negotiations. For another major glacier appears to have begun a rapid retreat into a deep underwater basin, a troubling sign previously noticed at Greenland’s Jakobshavn Glacier and also in the Amundsen Sea region of West Antarctica. And in all of these cases, warm ocean waters reaching the deep bases of marine glaciers appears to be a major cause. The midnight sun still gleamed at 1 a.m. across the brilliant expanse of the Greenland ice sheet. Brandon Overstreet, a doctoral candidate in hydrology at the University of Wyoming, picked his way across the frozen landscape, clipped his climbing harness to an anchor in the ice and crept toward the edge of a river that rushed downstream toward an enormous sinkhole. Mr. Overstreet’s task is to collect critical data from the river, and is essential to understanding one of the most consequential impacts of global warming. The scientific data he and a team of six other researchers collect here could yield groundbreaking information on the rate at which the melting of the Greenland ice sheet, one of the biggest and fastest-melting chunks of ice on Earth, will drive up sea levels in the coming decades. The full melting of Greenland’s ice sheet could increase sea levels by about 20 feet. The new fast-moving glacier is the Zachariae glacier or Zachariæ Isstrøm, located in the far northeastern part of Greenland. In a new paper in Science, Jeremie Mouginot of the University of California-Irvine and his colleagues find that the ocean-based glacier, which contains 0.5 meters or a foot and a half of potential sea level rise, has begun a rapid retreat, especially since 2012. The glacier has lost fully 95 percent of the ice shelf that used to help stabilize it, they say, and now sports a 75 meter high ice cliff extending above the water (the glacier also extends hundreds of additional meters below it). “This is sort of the second major floodgate from Greenland that has opened up,” says Eric Rignot of UC-Irvine and NASA’s Jet Propulsion Laboratory, one of the authors of the study. The first, says Rignot, was the Jakobshavn glacier, Greenland’s “fastest” moving, according to a recent study, which is currently based 1,300 meters below sea level and also retreating into a deep basin. Now, at Zachariae, that seems to be happening again. In combination with its nearby neighbor, Nioghalvfjerdsfjorden glacier, the two glaciers contain a potential 1.1 meter of sea level rise (over 3 feet), so any change here is not good. “If you see Greenland as a boat, it’s like we’re taking water from every side now,” says Mouginot. 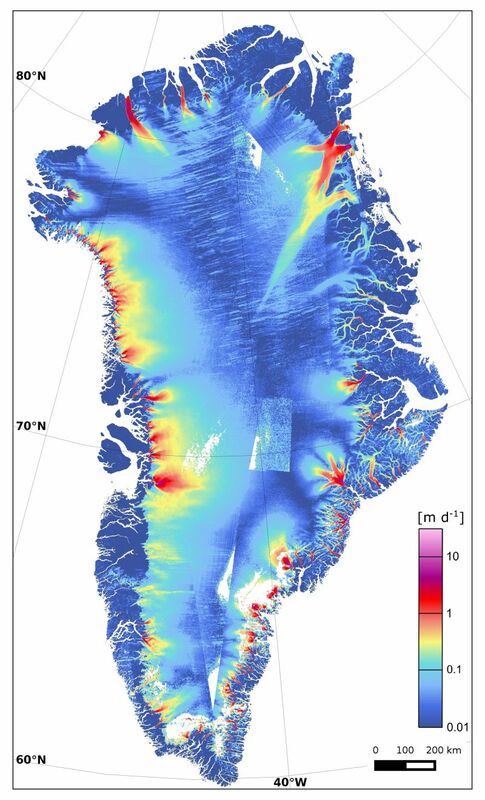 Furthermore, Mouginot, Rignot and their colleagues note that Zachariae and Nioghalvfjerdsfjorden together form the terminus of the northeast Greenland ice stream, “the only large, dynamic feature that extends continuously deep to the ice sheet interior near Greenland’s summit.” Twelve percent of the entire Greenland ice sheet, they say, therefore drains through this region. "Not long ago, we wondered about the effect on sea levels if Earth's major glaciers were to start retreating. We no longer need to wonder,"
A massive glacier in northeast Greenland has dramatically melted in the past decade and would raise global sea levels by a foot and a half if it thawed completely, according to a study published Thursday. It was a "surprise" to learn how fast the large chunk of ice was shrinking, said Jeremie Mouginot, of the University of California, Irvine, lead scientist of the report. The glacier holds enough water to raise global sea levels by more than 18 inches if it were to melt away to nothing, but no timetable exists for how long that process could take, according to the study, published in the peer-reviewed journal Science. All by itself, it holds enough water to raise global sea level by more than 18 inches (46 centimeters) if it were to melt completely. And now it’s on a crash diet, losing 5 billion tons of mass every year. All that ice is crumbling into the North Atlantic Ocean. Just next door, there’s another melting glacier called Nioghalvfjerdsfjorden that could raise sea levels another 21 inches, totaling 39 inches globally. What does that look like, independent of any other global sea rise? "The glacier has profoundly transformed in only 10 years," Mouginot, said. "The glacier is now breaking up and calving high volumes of icebergs into the ocean, which will result in rising sea levels for decades to come." 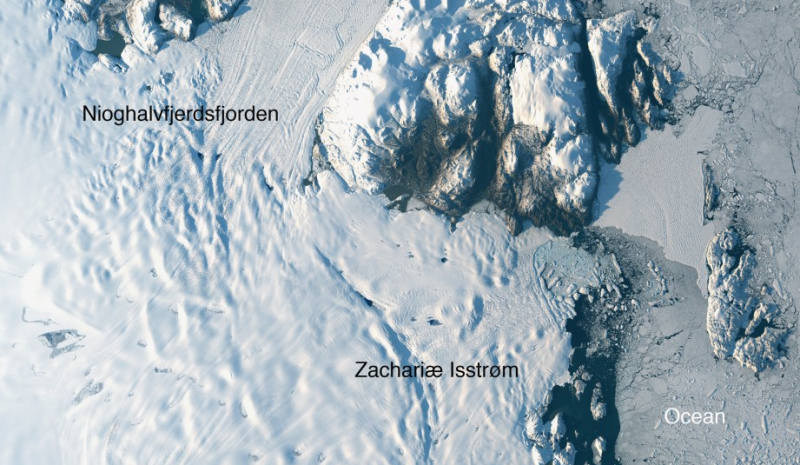 The melting of the "Zachariae Isstrom" glacier is a result of warming temperatures both in the sea and the air, said study co-author Eric Rignot, also of UC-Irvine. "The top of the glacier is melting away as a result of decades of steadily increasing air temperatures, while its underside is compromised by currents carrying warmer ocean water, and the glacier is now breaking away into bits and pieces and retreating into deeper ground," he said. The glacier is near a large one also melting rapidly but at a slower rate. The two chunks of ice make up 12% of the Greenland ice sheet and would boost global sea levels by more than 39 inches if they both totally collapsed, a process that would likely take centuries. The planet's two major ice sheets are in Greenland and Antarctica, and together make up 99% of the freshwater ice on Earth, according to the National Snow and Ice Data Center. In Greenland, ice sheet decline continues to outpace accumulation, because warmer temperatures have led to increased melt and faster glacier movement at the island's edges, the data center said. "Not long ago, we wondered about the effect on sea levels if Earth's major glaciers were to start retreating. We no longer need to wonder," Rignot said. "For a couple of decades now, we've been able to directly observe the results of climate warming on polar glaciers. The changes are staggering and are now affecting the four corners of Greenland. "The entire ice sheet of Greenland contains enough ice to raise sea levels some 20 feet. It has been losing ice rapidly in recent years, through a combination of meltwater runoff on the ice sheet’s surface – which reaches the sea through complex channels and fissures — and the calving of large icebergs from its glaciers. Both of these processes have elements that can be pretty spectacular. Atop the ice sheet, vast meltwater lakes can form and then suddenly vanish in a matter of hours, draining rapidly as crevasses open beneath them and they spill into the ice sheet’s depths. At the front ends of marine glaciers, meanwhile, detaching icebergs can tumble and slam back with such force that they knock the glacier itself backwards, and trigger magnitude 5 level earthquakes. NASA estimates that currently, through the combination of these mechanisms, the Greenland ice sheet is losing several hundred billion tons (or gigatons) per year and raising sea levels by three quarters of a millimeter annually. If so, that would be a little under a third of the total global sea level rise, which is currently 3.24 millimeters per year. And now, Zachariae glacier may be poised to add to that total. From 1996 through 2010, the new research finds, Zachariae glacier’s grounding line — where the glacier simultaneously meets both the seafloor and the ocean — retreated inland 3.5 kilometers. But then from 2011 through 2015, it retreated another 3.5 kilometers, a sure sign of acceleration. A key event in letting the glacier speed up seems to have been the collapse of its ice shelf, a buttressing tongue that used to extend out over the fjord in front of the glacier, creating an underwater cavity beneath it. Now, in contrast, Zachariae is basically a steep cliff. Other ways of measuring the rate of change of the glacier — its rate of thinning, for instance, or its flow speed into the sea — were also observed to be increasing in the new study. “This study does a nice job of putting together data from multiple sensors to document the ongoing speed up of this glacier. At present its contribution to sea level is relatively small, but there is certainly the potential for it to increase more over time,” says Ian Joughin, a Greenland and polar science expert at the University of Washington, in Seattle, in a comment on the new study. Joughin notes that thus far, despite the fast retreat, Zachariae is not losing as much ice each year as the Jakobshavn glacier in central western Greenland is losing. The new study reports a loss of 5 gigatons annually for the Zachariae glacier, or 5 billion metric tons, versus 25 to 35 gigatons for Jakobshavn, according to Joughin. Joughin thinks Zachariae may not catch up to the latter, since the basin into which it is retreating is not as deep. But Rignot notes that with 1.1 meters of potential sea level rise between them, the Zachariae and Nioghalvfjerdsfjorden glaciers together contain about as much ice as the very worrisome glaciers along the Amundsen Sea coast of West Antarctica. Granted, in the latter case the situation is worse because losing those coastal glaciers would then unleash a bigger destabilization of West Antarctica as a whole. Still, Greenland’s glaciers face a kind of double threat — not only changes in the ocean, but also rapidly rising Arctic temperatures, meaning that they can melt both from above and below. The key question, however — as with all studies of glacial retreats in regions with the potential to cause major sea level rise — is how much and how fast. And that’s also, of course, the hardest one to answer.